AFTER THE SAD,long night when Jesus was captured in the garden, morning came at last, and the news began to spread through the city streets that Jesus, the prophet from Galilee, was now a prisoner. His friends were terrified, while his enemies laughed in wicked glee. And the soldiers led him before the Roman governor, Pilate, for this governor now took the place of the King Herod who had tried to kill Jesus when he was born, in Bethlehem.Pilate knew nothing about Jesus. He took him into his judgment-hall and talked a while with him. And he was surprized to hear the wisdom of this one whom the Jews were condemning to die. But the Jews cried the more loudly that Jesus should be put to death, saying that he had stirred up the people throughout the country, even from Galilee. When Pilate heard that Jesus was from Galilee, he said, “This man belongs to the country that Herod rules.” This Herod was a son of the wicked king who tried to take Jesus’ life when he was a baby. Pilate sent Jesus to Herod at once, for Herod was in Jerusalem at that time. Now this was the Herod who had caused John the Baptist to be put to death. He had heard much about Jesus, but he had never seen this prophet from Galilee. When the soldiers came, bringing Jesus bound with chains, Herod was glad, for he hoped that Jesus might do some miracle before him. At once he began to ask questions of Jesus, but not one question would Jesus answer. The chief priests and the scribes stood round about and said all kinds of evil things about Jesus, still he would not speak one word to defend himself. Finally Herod grew impatient with this silent prisoner. A wicked thought came into his heart, so he began to make fun of Jesus. With his soldiers he mocked Jesus, dressing him in rich garments and pretending to honor him as a king. Then he sent him back to Pilate. Pilate, too, wished to free Jesus; for he could find no guilt in him. He told the accusers that neither he nor Herod had been able to find him guilty of death. Pilate knew the Jews could accuse him to Caesar if they were displeased with him, and being a coward he chose rather to let an innocent man suffer than to be in danger of losing his position as governor. As the trial went on, Judas Iscariot saw that Jesus was condemned to die. Now his guilty conscience troubled him greatly. He had hoped that Jesus would free himself in some miraculous way from the power of his enemies; but now he saw that Jesus was allowing himself to be helpless in their hands. The chief priests and scribes looked scornfully upon Judas and replied, “What is that to us? You yourself must answer for your sin.” And they turned away from him, refusing to take back the money they had given him for doing the dreadful act. Neither would Judas keep the money, so he threw it upon the floor of the temple and ran down the long flight of steps, away to a lonely place, where he hung himself and died. Before giving Jesus up to die Pilate talked to the restless mob about another prisoner whom he held–a wicked man named Barabbas, who as a robber had caused much trouble to the Jews. At the time of the Feast it was customary to release a prisoner, and Pilate asked whether he should release Barabbas, the wicked robber whom the people feared, or Jesus, the innocent man whom they hated. All these shameful things Jesus bore in silent for he was suffering in the place of those who deserved to suffer for their own sins. Finally the soldiers took off the purple robe and dressed him once more in his own clothes. Then they led him away outside the city to nail him on a cross. They took two other prisoners, men who had been thieves, and laid heavy crosses on the bared backs of these men, then led them away with Jesus to die. A crowd of curious people followed the soldiers through the gate to the hillside where the crucifixion took place. Many in the crowd were enemies of Jesus, others were friends who longed to help but could not. As they went, Jesus sank down beneath the weight of the heavy cross he bore, and could not rise again. The cruel soldiers then called a stranger from the crowd and placed the cross upon his shoulder, for Jesus was too weak to carry it any farther. But Pilate would not change the writing, and all who passed by could read what he had written, though they were strangers in Judah. While Jesus hung on the cross, one of the thieves began to mock him, but the other begged to be forgiven and to be remembered when Jesus came into his kingdom. He believed that Jesus was really the King from heaven, which the Jews were unwilling to receive. The thief knew that his sins were forgiven, and though he was suffering much pain a glad joy came into his heart. While Jesus hung on the cross he saw a group of sorrowing friends standing at the edge of the crowd, and among them was his own mother. John, the disciple who loved him so much, was also there, and Jesus asked John to take care of his mother from that time. 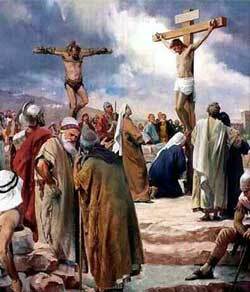 The enemies of Jesus stood around the cross, making fun of him and telling him to come down if he were the Son of God. About noonday the sky suddenly grew dark. For three hours the great darkness lasted, then Jesus cried with a loud voice, saying, “It is finished!” and soon he died. The Roman captain who stood near the cross, and the soldiers who were with him, saw the rocks torn apart by a terrible earthquake that came, and they were frightened.